A stylish, modern restaurant of elegance, Monmouth Kitchen flaunts sophistication at its finest. Another fantastic addition to the intimate wonderland of Seven Dials, Monmouth Kitchen has built an impressive reputation in the heart of Central London. A menu of variety, split down the middle between piquant Peruvian and appetising Italian, Monmouth Kitchen serves contemporary tapas, an innovating dining experience for London’s primary foodaholics. Dining with my fussy boyfriend who takes a dislike to seafood (unbelievable I know), we stuck to the meaty side of the menu, which was just as desirable. 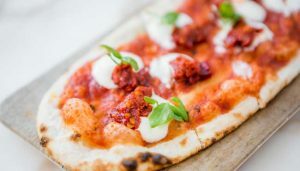 We shared six delightful small plates, the Spicy Nduja Pizza with Soft Cream Cheese and the Chicken Anticucho Skewers was perfectly delectable, where the spice levels seamlessly hit the back of our taste buds. However, the White Ragu and Mozzarella Arancini took my favour, a virtuous choice for a cheese lover, the first bite struck the succulent flavours of sweet, creamy cheese. The exterior consisted of thick deep-fried crispy breadcrumbs holding together risotto rice with piping hot mozzarella cheese which gently ooze out the crispy ball of impeccable taste. Whilst I was less impressed with the Spicy Chicken with Rocoto Yoghurt Tacos as they came served as a cold dish, and the size of a Lego piece, the real winner was the Sliced Beef Tenderloin Anticucho. The slow-cooked beef was prepared in such refinement, where the combination of the tender meat with aromatic spice truly hit the spot. To fulfil a sublime evening, the Passori Rosso Merlot was an endearing addition to our perfectly pleasant meal. The wine exquisitely bore tastes of red berry spice and sweet fruity plum, which was consumed amiably like velvet. The vibrant atmosphere in Monmouth Kitchen demonstrated the contemporary restaurants’ success. The glowing ambience in the restaurant was youthful, with Maya Jane Coles playing in the background, the restaurant was crowded (granted it was Valentines Day) but still ever so pleasant. High quality ingredients for an affordable price, if sharing is your thing definitely give Monmouth Kitchen a try.